My alarm rudely awakens me this morning. I am warm and safe, enveloped in my cocoon of blankets. Light rain taps and merrily dances on the roof, creating a lullaby that tempts me back into slumber. I can hear the low purr of my cat, Neville, at the foot of my bed, who is also curled tightly into a furry ball enjoying the melody of the rain. I am content. Then my stomach growls, demanding to be fed. And I remember. Brunch. Ladies and gentleman, that is the only thing that got me out of bed this morning. Brunch at Fassler Hall. Fassler Hall is located in the trendy Mid-town district of Oklahoma City and known for their German beer and succulent bratwurst. They also have a dog-friendly night scene with a DJ on the weekends. Only recently did I realize they had brunch. Some new friends of mine were supposed to go hiking today, but leave it to Oklahoma weather to spoil those plans. So we went to brunch instead. We got there right when they opened and had no problems finding a place to sit. We were a large party and they have a great set up for that. If you went out the night before and had one to many tequila shots, no worries. They have coffee and mimosas! Their mimosas can be made traditionally with orange juice, or you can have it with pineapple, cranberry, or grapefruit juice. Options are important when planning the perfect brunch experience. I ordered the traditional mimosa with a cup of coffee and some water. For some reason, everyone else was getting only water and coffee. Catching the envious glances of my friends, I temped them with sips, which led to them following my lead. Brunch without a mimosa is just a crime and setting a good example is necessary. Mimosas for all. Fassler hall has an enticing, yet simple brunch menu. Sometimes too many options for brunch can be confusing and stressful. Too much thinking on a Saturday morning is a travesty and an activity that should be used sparingly when not at work. They break it down to the necessities: Tacos, burrito, biscuits, and waffles. Chicken and Waffles was the crowd favorite today, and the option I chose as well. 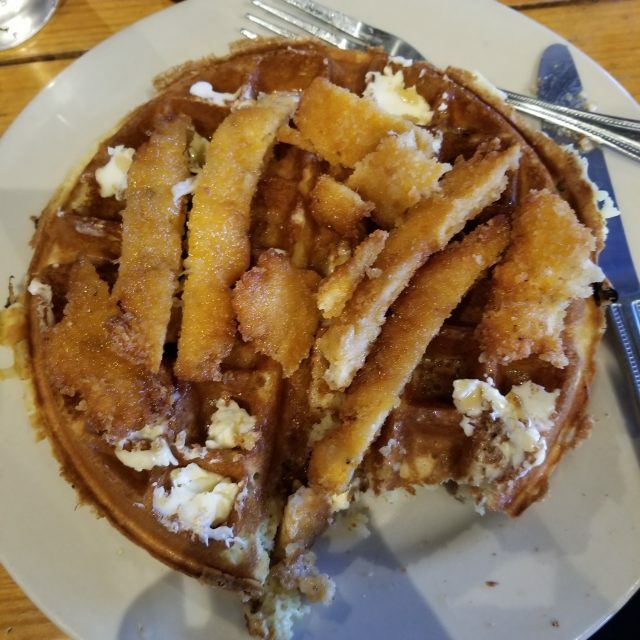 Chicken and Waffles is one of those dishes that I always entices me, but opt for other things due the size and caloric content. But this was proportioned just right. Light and crispy Belgian waffle, juicy, crunchy chicken, a dollop of real butter, and hot, sweet maple syrup. Savory and sweet. Not only was this dish delicious, it was the perfect price and portion size. The chicken had been flattened, battered and fried, so it wasn’t like you were getting uneven chicken-ness on your waffle. I could have used a tiny bit more maple syrup, but I am a syrup drunk. Another great dish was the Spicy Fried Chicken biscuit. 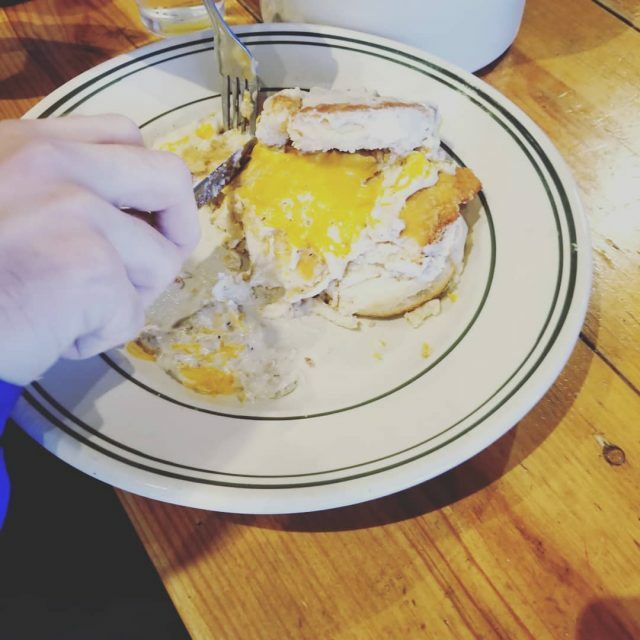 A hot, flaky, buttery biscuit topped with spicy fried chicken, Fassler breakfast sausage gravy, and melty American cheese. I did not try this, but it was my second choice. I will be having it next time. Fassler Hall is a great place to get your friends together and go wake up! While you are waiting on your food, sip on an adult beverage and play some Jenga out on the patio! Have you been to Fassler Hall for Brunch? What did you get? How was your experience? Until next time, Happy Brunching!